Traveling to a developing nation is exciting, nerve raking, and can be dangerous. Forty-five members of the University of Kentucky set off to Ecuador. The brigade, led by Dr. Tom Young, pediatrician at Family Care Center in Lexington, KY, set off to visit a clinic in Santo Domingo de los Tsachilas, a province that has just celebrated its first year of existence. Trying to get a lot of people to one place at one time is challenging. So, of course, several people arrived twenty-four hours late. The Lion King popularized the Swahili saying "Hakuna Matata! ", which means no worries, and this became our catch phrase while traveling. Then it was off to work in Santo Domingo. But to descend the mountains, buses need brakes. Hakuna Matata! A short stop and quick fix and we had brakes. Santo Domingo a town of nearly a half million people with a large immigration population of Columbians. Not many medical brigades visit this region. This is why Dr. Young chose this city for a full-time clinic and biannual medical brigade visits. 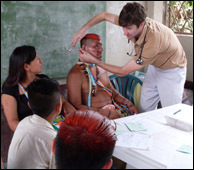 There is also the added benefit of having the unique Tsachilas Indian population about an hour away, for whom we also provided medical care. The large group was divided into two and we alternated clinic sites: one group stayed in the city and worked at the clinic and the other went to the Tsachilas village and set up a clinic in the schools. Getting to the Tsachilas can be difficult; a heavy rainfall can wash away the dirt roads. Of course our bus got stuck several times, but Hakuna Matata prevailed and we arrived at the clinic and saw about 125 children, men and women each day. The groups would alternate sites and were equally divided so that not only acute medical care was given but also preventive health materials and education were provided. Primary care is very difficult in third world countries because once the volunteers leave, so does the health care. Education and knowledge will stay and grow and with the presence of the year-round staffed clinic, and a large medical need will be served. Thanks to the Benjamin H. Josephson, MD Fund, several members of our trip were able to go and serve.